Summer Internship Program an Investment in Future – Peninsula Moves! Public transportation, once considered “uncool” has become cool. According to the American Public Transportation Association (APTA), Millennials are increasingly becoming multi-modal and moving to communities that provide robust public transportation options. From 2001 to 2009, the number of passenger-miles traveled per capita by 16 to 34 year-olds on public transit increased by 40 percent. Sixty-two percent of people ages 18-29 said they would prefer to live in an area described as having a mix of single family houses, apartments and condominiums, with stores, restaurants, libraries, schools and access to public transportation nearby, than in a sprawl-style neighborhood. The demand for more and better public transportation has created a need for highly-trained public transportation professionals. SamTrans’ summer internship program is addressing that need by mentoring planning and engineering students looking for hands-on experience in the transit industry. Six college students are participating in the program this summer. Alexa Morales’ real-world experience had a virtual beginning. From the Stevens Institute of Technology in Hoboken, New Jersey, Morales found both the internship position and housing on the Internet. After a four-day cross-country drive, she landed in Daly City, “which is great because it’s close to BART.” The civil engineering major is paired up with Program Manager Patrick Kitto, himself a former SamTrans intern. Samuel Moffitt grew up in Placerville and is majoring in environmental science and management at University of California, Davis. A conductor on one of the University’s famous double-decker buses, Moffitt was looking for a transportation internship. He has started an analysis of the shuttle that operates between the Belmont and Hillsdale Caltrain stations. Jenny Ha, a student at Cal Poly San Luis Obispo, calls San Jose her hometown. Majoring in city and regional planning with an emphasis on geographic information systems, she is using GIS to map all of SamTrans’ bus stops. 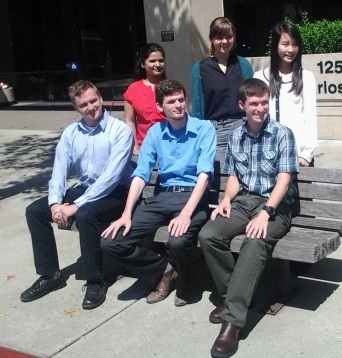 Two interns, Daniel Shockley and Sonal Aggarwal, will be working with the Caltrain Modernization Program team. Shockley has an undergraduate degree in literature from University of California, Santa Cruz. He grew up in Walnut Creek where he drove everywhere he needed to go. When he moved to Santa Cruz he started riding his bike to get around town. “This started me thinking about what it was about the two communities that made me change the way I traveled,” he said. Shockley is studying for a master’s degree in urban planning at University of California, Los Angeles. Sonal Aggarwal has traveled the furthest distance. A native of India, she earned degrees in architecture and environmental planning before working on affordable housing. In India she relied solely on public transportation. After coming to America, Aggarwal said, “I struggled for a year,” before she broke down and got a driver’s license. Michael McAlister grew up in Alameda and has an undergraduate degree in linguistics. While traveling in Europe, “I became intrigued by the transportation system there.” He is cleaning up the planning department’s collection of GIS data. Both Aggarwal and McAlister are working towards a Master’s degree in urban and regional planning at San Jose State University. SamTrans looks forward to the important contributions this year’s summer interns will make wherever THEY go in the transportation industry.